The summer placement process for the 2013-15 batch of the Indian Institute of Management Tiruchirappalli (IIMT) has been successfully completed. The success is strongly attributed to the faith and confidence reposed on IIMT’s students by recruiters. In addition, the success also bears testimony to the skill and perseverance of IIMT’s people―its students and faculty. A total of 45 Companies from various domains such as BFSI, Consulting, FMCG, Consumer Durables, IT/ITES, Manufacturing, Automobile, Digital Media, Advertising, Energy, Sports and Law etc. participated in the institute’s recruitment process. The companies offered diverse and enriching profiles such as Consulting, Sales & Marketing, Operations, Supply Chain Management (SCM), Finance, Human Resources (HR), and IT/ITES. Roles in niche interest areas, such as Digital and Social Media Marketing, Sports Consulting, Alternate Channel Promotion, Brand Management, Portfolio Fund Management etc. were also offered to cater to varied aspirations of the students. This year’s highlight was the diverse mix of profiles offered, be it industrial domain or function. The profiles offered by the companies visiting campus bear testament to the quality and efforts of the institute. Summer internship offers were made by the recruiters to all 94 students registered for campus placements. Thirteen students opted out of summer internship process to seek opportunities in specific areas of their choosing. They opted for social media analytics, credit analysis, risk management and enterprise solutions. World Bank participated in the process for the first time and offered roles in their Financial Instruments Department. Reserve Bank of India, Citibank, ICICI Bank and DCB Bank offered roles in operations, finance and marketing functions. Further, Marmore, ICCL (BSE) and IIFCL offered equity research, risk management and project finance roles. Also, Prequate Mindworks, Explico Consulting and Basket Option offered positions in finance and marketing. 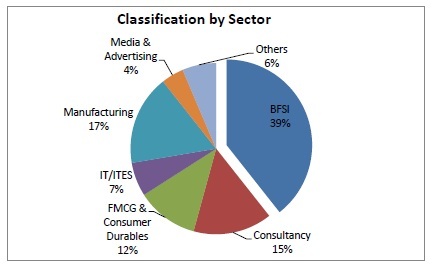 The BFSI sector emerged as the top recruiter with 39% of the batch being placed there. Dabur, Mapro, TTK Prestige, Emami and United Biscuits offered roles in marketing function. Mapro offered a market research role for the students. Dabur, United Biscuits and Emami offered roles in sales and retail management. Mahindra offered positions in operations and marketing divisions. TAFE and Larsen & Toubro offered roles in HR and marketing functions while Saint Gobain and Garuda Vaayu Shakti Ltd. offered sales and business development profiles. Further, TVS Srichakra offered internships in operations, SCM and sales. While Reliance Broadcast Network offered roles in sales and marketing functions, Draft FCB Ulka offered internships in advertisement. In addition, Simplify 360 offered social media and marketing profiles. KPMG, Cognizant Business Consulting and HCL Axon offered roles in strategy, operations and SAP consulting. Index Advisory, Nodwin Consulting and Knowledge Faber Consultants offered roles in management consulting. Further, ACH Consultants offered internships in marketing whereas Metis India offered roles in HR consulting. Indus Law and Kshatriya Sports offered positions in valuation and sports consulting respectively. MyDeals24x7 offered business development profiles. In addition, TCIL offered roles in logistics and market research, and Hidesign in HR functions. Simplify 360, Reliance Broadcast Network and DCB among others. World Bank offered roles in their Financial Instruments department while ICICI Bank offered profiles in Corporate Banking and Wealth Management. In addition, Reserve Bank of India, Prequate Mindworks, Kshatriya Sports, Indus Law, Basket Option and Explico Consulting recruited students for positions in corporate finance, portfolio fund management and mergers & acquisitions. Further, Marmore, ICCL (BSE) and IIFCL recruited interns for equity/industry research, risk management and project finance respectively. Other profiles offered in this function include Business Advisory and Transaction Review among others. Operations roles offered this year came from different sectors such as BFSI and Manufacturing. Citibank and DCB offered profiles in operations management. In addition, TCIL and TVS Srichakra offered roles in SCM and operations. Mahindra recruited students for its GMC program while KPMG offered internships with their Strategy and Operations business unit. The students also received offers from firms such as Cognizant Business Consulting, Saint Gobain, HCL, Index Advisory, Nodwin Consulting, Knowledge Faber Consultants and Explico Consulting. The profiles offered include project Management, consulting, business research and process optimization. MyDeals24x7 offered business development roles. Companies offering IT roles included HCL, Lapiz Digital and Doodle Blue. HCL and Lapiz Digital offered business development and business analyst roles respectively. Doodle Blue offered creative product development roles. Profiles in the HR function were offered by TAFE, L&T, Hidesign and Metis India. Metis India offered HR consulting roles involving integration during mergers and acquisitions process. Hidesign and Larsen and Toubro offered roles in performance management, recruitment and training. A successful beginning and a strong follow through that exceeds expectations―this has been the hallmark of IIM Trichy’s summer placement process. IIM Trichy is thus firmly set on the paths of excellence. The high quality inculcated in our students has secured the confidence of recruiters and enhanced the reputation of the institute’s program and rigour. We thank our recruiters for their enthusiastic support. Providing the highest standards of quality to the industry shall always be our firmest resolve.